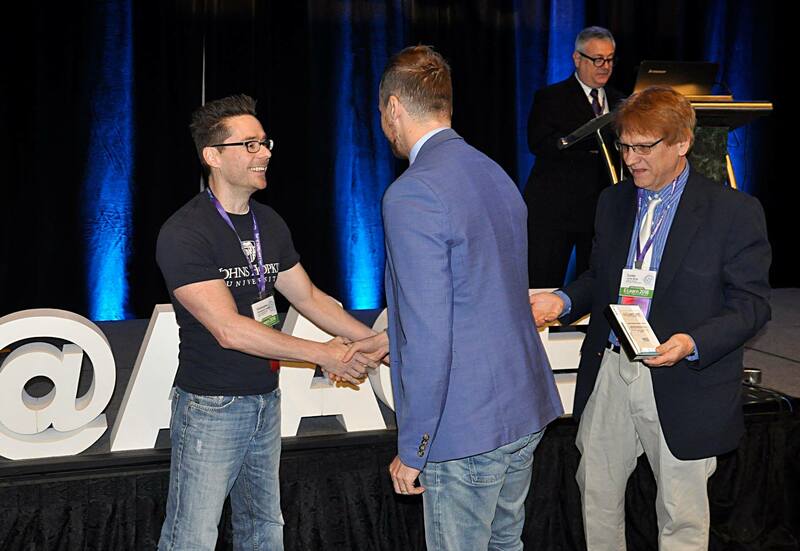 Each AACE conference awards best papers to honor submissions that offer a significant contribution to the field of educational media, learning and technology. Award paper publications are typically available as open access through LearnTechLib. These conference highlights comprise some of the theoretical and practical innovations that are likely to shape the future of edtech. As conference chair Saul Carliner puts it: “There are always a group of papers that explore ways to push the boundaries on technology. That’s kind of a fixture at E-Learn”. This year, the committee have out 4 award paper at the E-Learn 2018 conference in Las Vegas, NE. Topics cover machine learning, flipped classroom, computer technology in elementary school math and virtual writing groups. Methodologies vary from single case study designs to comprehensive meta alaysis. Download and review whatever sparks your interest or use this systematic overview to orient yourself on current ideas, technologies, methodologies and approaches. Learn what it takes to win a best paper award, and keep an eye out for our interviews with selected best paper winners on AACE Review. Summary: There are a number of teaching methods based on physical activity, where body movement and physical activity are utilized in the learning process. There have been many benefits found to using bodily learning in the classroom. Machine learning methods have not been used much in educational research so far. Research Methodology: This study was conducted at a lower secondary school during the 2016-2017 school year. The researcher delivered a two-hour workshop called Physics by Dancing, which consisted of three sections: motion, equilibrium and rotation. At the conclusion of the workshop, the students responded to a questionnaire. The two main research questions of the study were: Was there any differences between students who liked and disliked physics in experiencing the new bodily teaching methods? And What kind of sub-categories of students can be detected by unsupervised machine learning? Key Findings: The views towards the workshop of the students with the most positive attitude toward physics as a subject and those with the most negative attitude toward physics were statistically significantly different. Despite this difference, students in both groups found the workshops mainly necessary. Students had a positive experience of bodily learning and the use of physical activity in teaching. Boys were particularly motivated by the competitive sections of the workshop. Deviating from the traditional routine teaching methods can increase students attention and contribute to a memorable learning experience. Summary: Technology-supported instruction has been shown to influence students competency in mathematics, and also their thoughts and perceptions on the subject. Past research comparing the effects of computer-supported mathematics instruction and other types of instruction in Taiwan are conflicting. The purpose of this study was to provide a meta-analysis to compare the effect of technology-supported mathematics instruction and traditional instruction for students in elementary schools in Taiwan. Research Methodology: A meta-analytic approach was utilized in this study, with the purpose of synthesizing and analyzing the available research on the effects of Technology-supported Learning and Conventional Learning. The researchers used a comprehensive search of literature published between 1993 and 2017 to find the studies for the meta-analysis. Eight variables were coded for each study. Four variables were on Study Characteristics: Grade level, learning area, type of publication, and year of publication. Four variables were on Program Characteristics: Method of Integration, Learning device for student, Teaching device for teacher, and Intervention Duration. 164 studies were included in the meta-analysis. The results indicated that students in Technology-supported Learning classes had a significantly higher achievement than students in Conventional Learning classes. Students’ mathematics achievement in Technology-supported classes were significantly better than in Conventional Learning classes for all elementary learners, regardless of grade level. Summary: A growing number of teachers have started to use flipped classrooms. This teaching strategy involves moving the lecture content before class and working on homework and hands-on activities during class time. This study utilize the theory of planned behavior to assess the intention change of preservice teachers regarding technology integration. The researchers hypothesized that if preservice teachers are attending a technology integration course and use a flipped teaching method as a teaching tool, they will have a higher intention to integrate technology in their future classrooms: when they improve the mastery of the use of technology in teaching, when their peers, students and superiors favor them to do so, and when they are confident to integrate technology into their future classrooms. Research Methodology: Participants were 71 preservice teachers (graduate and undergraduate) enrolled in a required technology course at a university. The participants completed a Theory of Planned Behavior survey, which consisted of four sections: Attitudinal Beliefs, Subjective Norms, Perceived Behavioral Control, and Intention. Participants completed all surveys during the first week of the semester and then they attended a 15-week technology integration course. At the end of the semester, the participants completed a modified version of the same survey. Key Findings: The study found that a predictor model was able to account for 41% of the variance in students’ intention to use technology and was statistically significant. Preservice teachers perceived behavioral control toward their intention to use technology is generally a better predictor of their intention to act than their attitude. The results of the study suggest that although the use of a flipped teaching method can predict preservice teachers’ intention to use technology, it does not change their attitude and perceived behavioral control. Summary: The purpose of this paper was to share a review of the literature that examines current strategies and programs that support academic writing capacity development of early career academics, as well as to share findings from their pilot study of a virtual writing group. Expectations of early career academics have increased as they face a new publish or perish challenge within academia. Early career academics may encounter many challenges as they shift to their new academic positions. One of these challenges is how to increase publication output from that of a doctoral student mindset, to the development of research writing for high impact scholarly journals. One of the strategies to address this challenge that is common throughout the academy is the use of writing groups. There is limited research examining the structure and impact of writing groups in virtual environments and within the context of supporting early career academics as they transition from student to academic. Research Methodology: A pilot study of a virtual writing group was conducted in 2018 using self-study research methodology. This research explored a self-study of developing academic writing capacity within a virtual writing group environment. Questions about the experience were asked of the participant, and insights were gathered from the narrative reflection. Key Findings: From the analysis of the narrative responses, four main themes emerged: Individual attributes, Supportive characteristics of mentorship, Group supports, and Process supports. Each of these themes were found to have an integral role in developing early career academics’ writing capacity through the virtual writing groups.